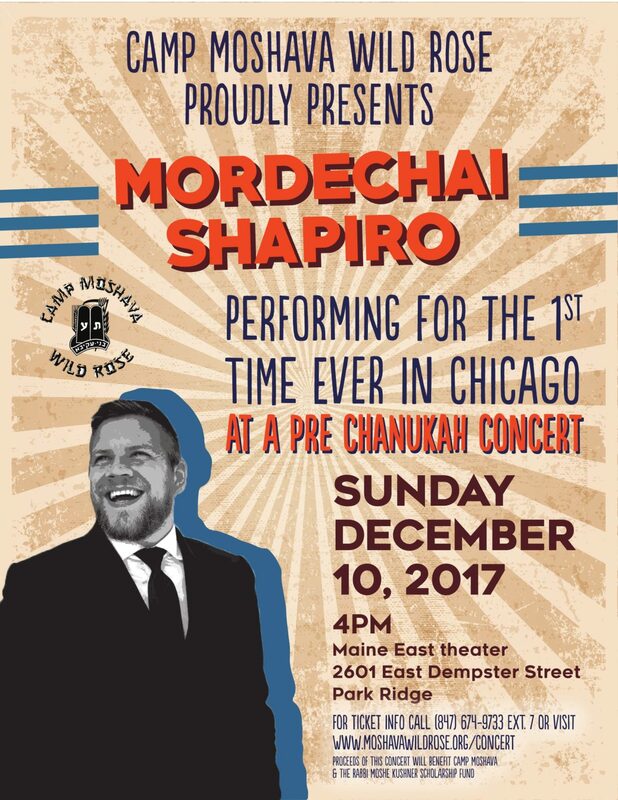 Mordechai Shapiro Pre- Chanukah Concert Huge Success! On Sunday evening December 10th Camp Moshava of Wild Rose held a pre Chanukah concert at Maine East high school. The Concert featuring Mordechai Shapiro was attended by over 970 individuals ranging in age from toddlers to grandparents in their 80s and represented by all members of the community. The event, was the second concert brought to the Chicago area by Camp Moshava in the last three years to promote “Achdut” within our community and to serve as a fundraiser for Camp Moshava’s scholarship program which helps insure that all children are able to attend. The evening was filled with unbelievable “ruach”, singing and dancing and was a great way to get ready for Chanukah. It was especially heartwarming when Camp Moshava’s director Josh Zwelling announced the camp’s new partnership with Yachad, which will begin this upcoming summer. Yachad members will be integrated this summer with all of the bunks and programs that Camp Moshava offers. There was a beautiful group of Yachad members that were in attendance at the concert and in the middle of the show, prior to intermission Mordechai Shapiro invited all the Yachad members to come up on stage and join him in singing his new song “yachad” . The evening was a tremendous success and enjoyed by all.